No beaten tracks; the roads in Madagascar are terrible. But when you're in a pirogue on the river Triribihina on your way to the Tsingy limestone mountains, you couldn't care less. And you don't miss running water when you can take a shower under a waterfall. The poverty-stricken population is friendly and nature is unique, with plants and animals you won't find anywhere else. Late in the evening we arrive in Madagascar. It was a long day. We flew to Paris and from there we took a direct, 12 hours long flight to Antananarivo Airport. Antananarivo, also called Tana, is the capital of Madagascar. Our hotel sent a car with a driver to pick us up. That's nice, because this way we don't have to struggle with porters and cabs who are waiting for customers. Hotel Sakamanga is furnished like a museum, with glass cases everywhere, photos, utensils, art and curiosa. That's great, especially because Tana doesn't have a museum. There are no tourist attractions here at all, so we do whatever we want. On our first day, we rest and get used to the place. We stroll around in the city, but avoid downtown. We'll save that for the end of our trip, when we'll be here again anyway and probably will want to buy some souvenirs. We walk on the shore of Lake Anosy. Along the water are very small houses which look like beach cabins. But they turn out to be diminutive barbershops, each with room for one chair. People don't mind us looking, everyone is friendly. That puts us at ease. Initially one doesn't know what to expect in a new country. Next day we rent a cab and take Route National 1 westward. There are few cars on the road, but many walking people, who carry loads on their heads. Every now and then we see a zebu wagon. I have to get used to the zebus: hunchbacked cows. It is a beautiful ride. We stop at a waterfall. The inhabitants of the nearby village are used to tourists. The make sculptures of black volcanic stone (pumice), which can be found everywhere around here. There is a sweet girl who speaks English well; she accompanies us. We buy one of her little sculptures. We agree to buy this kind of local craft on our trip. It's clear that people can use the money. On the way we stop to eat delicious fresh fish. Then we drive to the lemur park, where lemurs (prosimians) which were liberated from captivity get used to their freedom in the wild. They are fed and therefore can be seen easily. They are so cute; I'd love to take one home, but alas..
We continue our drive and stop at several markets, where we buy a papaya and then again an avocado. Everyone has fun. The car radio plays African music and the driver teaches us our first words of Malagasy. It's bee two days now and we've acclimatized already. In the evening we have dinner in our hotel and then we pack our suitcases for our trip to the Tsingy on the west coast. Our hotel's driver helps us plot a route. The Tsingy are world- famous, highly unusual limestone formations. Erosion has created a landscape with knife-sharp rocks and it should be worthwhile to see it with our own eyes. Next day we take the bus in southern direction, to Antiserabe. There we meet a French guy and a couple from Norway. We decide to trek to the Tsingy together. It's quite a journey, because there aren't roads everywhere. We'll travel by car for one day, then three days by pirogue on the river Tsiribihina and then one more day in a 4x4. We hire a guide, whose name is Charley. Because we won't leave tomorrow, we rent bikes and explore the surroundings of Antiserabe. We bicycle to a crater lake. It's a wonderful trip. Everyone waves and smiles at us. Every now and then, when we go up a mountain, we really have to push the pedals. But our efforts are rewarded when we arrive at the lake. The view is great and we bicycle around it. Many people are doing their laundry here. In a spot where there used to be a hotel are lots of small stands with precious stones. We buy two saphires and some other stone. We don't know anything about precious stones, we just buy what we like. They are only 12 euros a piece. We have a picnic on the shore of the lake, in the shadow of a tree. It's wonderful. On the way back we visit a workshop where zebu horns are used to make all kinds of utensils and tools. They show us how they do it: the horn is heated and molded and afterwards cut. Antsirabe is sometimes called the capital of the pousse-pousse. A pousse-pousse is a kind of riksha; a cart with two wheels, in which both people and goods are transported. In Antsirabe this is done by men with bare feet, who run very fast. I feel sorry for them and rather walk. There are hardly any cars. In the evening we have dinner with our group in a nice little restaurant. The cuisine is obiously influenced by French cuisine. Baguette is served everywhere and on the menu are dishes like honeyed duck and chicken ginger. For dessert, fruit flambé is popular, but it's extremely sweet. We have zebu meat, which of course is just beef and is used in stews. For sanitary reasons, we don't eat salads or other uncooked food: the water in which the vegetables are washed is not to be trusted. We drink mineral water, cola or beer with our meals. The brewery is in Antiserabe: THB (Three Horses Beer), which is light and tasty. Next day we drive to Mondrivazo by car. On the way we shop for our river trip. The villages we pass on our route get smaller and smaller. No asphalt, no electricity, but lots of happy people. On the way we buy a piece of sugercane as a snack: you're supposed to chew on it and then spit it out. It is incredibly sweet, we feel the enamel on our teeth crack. After trying a piece, we hand out the rest to the children in one of the villages, they love it. In Mondrivazo we have to report at the police station for our river trip and then we meet our three rowers. All in all, there will be nine people in the two boats. The hotel in which we spend our last night in the civilized world isn't much, but we have fun with the children who hang out there. The average family in Madagascar has seven children, so the place really swarms with them. Next day, pousse-pousses pick us up at the hotel with all our luggage. This time I don't have a choice and have to get in the cart with my backpack. The poor guy runs to the river, which takes half an hour. But he seems to have fun and even has enough breath left to joke with colleagues. The pirogues are carefully loaded. The luggage is placed to provide back rests. There are planks with rolled-up blankets on them to sit on. It's all amazingly comfortable. It's a fairy-tale trip. Incredibly beautiful. The rowers don't have to work very hard, because we're going downstream. They sing and at every village we pass, news is exchanged in a special sing-song tone over the water. We see all kinds of birds and other animals. Sensational is the alligator who lies on the bank, sun-bathing. Charley catches lizards and cameleons for us. We see bats in caves and many kingfishers with beautiful blue feathers. By the end of the day, we pitch our tents somewhere on the river bank. It's been a long time since I slept as well as tonight, in this little tent on the hard ground. The stars are beautiful and we cook dinner on a campfire. On the second day there's a waterfall where we can take a shower. It's one of those places you think only exist in pictures. The water is crystal clear and there are pools at different levels. In the uppermost pool a waterfall splashes down a few meters. There we take a wonderful shower. It's cooling and also a great massage. While we enjoy the water, the rowers prepare lunch. On the way they bought fish, which they now broil on a grill. We really are pampered. A little banana for dessert. The dishes are washed in the river and we're on our way again. The rowers sing and we are happy. Everyone is. Toward dusk, we pitch our tents somewhere and look for wood for our campfire. The atmosphere is great. On the third day we sail through a narrow canyon and then we are in an agrarian area and see a village every now and then. By the end of the day we arrive in a small village with only a few reed cabins. What follows is a nice surprise: from here we'll travel by zebu wagon. It's a one and a half hours trip along fields en through woods. A few times we ride in the water and we even cross a very wide river. It's clear that other modes of transportation are not viable here. It's late in the day and people are returning home from their fields. Two wagons join us, as well as lots of people on foot. We have never before been this far "off the beaten track" and we feel part of our surroundings. I think this is one of the most wonderful travel moments of my life. Children are playing, women are pounding flour, everyone is talking and exchanging news and people are singing. In the village where we will be picked up by a 4x4 tomorrow, a few cabins have been prepared for us and river water has been heated in the sun so we can wash ourselves. Everything is very simple, without running water or electricity, but it's clean. The food is also simple but tasty. And it's quiet and peaceful. At 7 PM it's pitch dark and people gather around fires or candles. People here are really extremely poor. Half of the population doesn't even have shoes. They really have nothing. But they're not pitiful. That is quite remarkable. If this is Africa, I love Africa. I love Madagascar in any case, even though traveling here is not easy. This certainly isn't a trip for beginning travelers. Next day we're picked up by the 4x4, but the car breaks down within 15 minutes. It's fixed, but after half an hour we stop again, and much longer. After the second attempt at fixing the car, it runs for another 15 minutes, while the inside of the car gets filled with gas fumes, and then it's over. The end of the car. Fortunately it's only a 15 minutes walk to the next village, where we cross the river by way of a pontoon bridge (linked boats with planks). We arrive in a larger village, where there is a phone and restaurants. Charley leaves us to organize a car and we just hang out and play cards. In some towns and villages are "cinema theaters." It's like this: someone builds a big shed, puts a generator in it and connects a television with VCR. He then buys music videos (the young Michael Jackson is popular, just like Bob Marley) and charges 10 cents admission. Inside the "cinema" ten or so lucky ones are watching the video, but outside at least a hundred people are peeking through the cracks in the wall, singing and dancing along with the music. I guess they play the same tapes over and over again, because groups of youngsters dance synchronous with the music. The boys dance with bare upper bodies, so their beautiful muscles are displayed. The music is extremely loud and from our terrace we watch a wonderful dance show. We see many women who have rubbed clay on their faces. I don't know whether they do that because they think the clay is beautiful or because it gives their faces a wonderful golden glow afterwards. The day is over quickly, even with the car troubles. I am so relaxed (I guess because of the boat trip) that I wouldn't have minded even if we'd had to wait for another three days. But we don't have to. By the end of the day, a car arrives. It's still a six hours drive on unpaved roads, through rivers, for the greatest part in darkness. We arrive at the Tsingy and pitch our tents. The Tsingy is a large nature reserve with knife-sharp limestone rocks. It was created by a special type of erosion. Next day we enter the park with a guide. At the entrance we all get a belt with ropes and hooks to secure ourselves during parts of the hike. It turns out to be real climbing. We also go through caves, sometimes crawling, and over ravines with suspension bridges. I have never before climbed with ropes, but I like it, even though I'm very clumsy. Yaron has to give me instructions all the time: left foot to the right and now move your hand, and now your foot, now secure your rope. Because it's all very sturdy, I'm not afraid. When we reach the top, the view is stunning. On the way we see sifakis (one of the larger kinds of lemurs), one of them has a baby, and other animals, like mongoose (a small predator). We hike for five hours and then I'm exhausted. I wash myself with a bucket of river water, while Yaron and others take another hike, during which they see lots of extraordinary animals: all kinds of lemurs and a pretty owl. Next day we drive through a pretty area with many baobab trees to the coastal town of Morondava. Sometimes the extraordinary landscape makes us feel as if we're on a different planet. 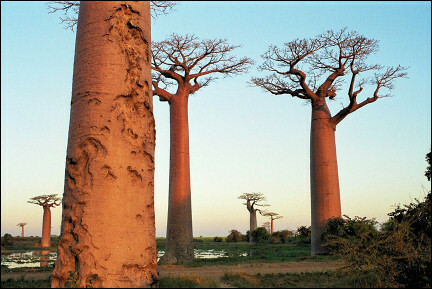 Each and every baobab is so special that we keep taking pictures. Some trees are very wide, they can be over 150 years old. Some have names the local population gave them and those are sacred. In Morondava at last we sleep in real beds, in a bungalow on the beach, with electricity. But we don't have a clue how to travel from here. The trip to the Tsingy is over and we take our leave of Charley. Everything here is "mura mura": nice and easy. It turns out to be difficult to leave Morondava. We even consider to rent a sailing pirogue, but that would take 3-10 days. Eventually we rent a 4x4 with the other people in our group and spend three long days on the road to Tulear, a city with 100,000 inhabitants in the south, 400 kilometers from Morondava. We drive through rivers, in a jungle with small villages, over soft sands and dry rivers. The last night of our trip we spend in Hotel California, which we immediately rename "Guantanamo Bay." But we don't have a choice. We left this morning at 6 and now it's 7 PM and pitch dark. In the bar are drunken soldiers, there are rats and mega-cockroaches and the bed is a construction of seven planks with a very thin foam rubber mattrass. The toilet I only know from hear-say, I didn't go there. We hang up our mosquito net (I believe it protects us against everything, even drunken soldiers), I lie down like a fakir, spreading my weight over seven planks and I sleep like a log. That is better than listening to all the scuffling. Tulear is an extremely poor city, there are no cars at all. At home we complain about traffic jams and now we're in this huge country almost without roads. We stay in hotel Le Sax'Aphone for three nights. We need a break. The hotel-owners owned a nightclub in Montpellier before they lived here. Before dinner we drink a pastis (or two), with the delicious French food a bottle of wine and we listen to French jazz, or someone plays the piano. The hotel, which consists of several buildings, is guarded by a man with a red T-shirt, bare legs and feet, who has a flashlight in one hand and a spear in the other. In the hotel also is a camera crew of the French television. We still feel healthy and fine (even though Yaron inadvertently drank tapwater from a bottle that was meant for the car's radiator). Tonight a final bottle of wine and then - at most - local rum. From Tulear we take a taxi-brousse to the north, via a large nature reserve with tropical rainforest: Ranomafana. Taxi-brousse is the local public transportation with vans that follow fixed routes. It's a great system, but it has its downsides: they only leave when they're full and that means twice as many people as the bus is meant to carry. But it's the best way to get in contact with the local population (unfortunately also physical) and therefore more fun than flying or renting a car. The first part of our route to Ambalavao we travel by mail bus. It takes ten hours. But the drive is fraternizing and it's cozy. Two seats in front of us are a father, mother, grandmother and a one year old baby. The father speaks a few words of English and is very proud of it. All of a sudden he says: "My baby likes white people. My baby doesn't like black people." We are flabbergasted. Fortunately nobody else in the bus can understand what he says. In Ambalavao we rest for a day. We visit a nearby nature reserve and after that the zebu market and the regular market. It's great, even though their way of treating animals is different from ours. Here we also see how people make paper with pressed flowers in it. We drive to Ranomafana, a village in a large tropical rainforest, in half a day. We hike in the rainforest for two days, with a guide. There are paths, but there is much climbing and sometimes the path is slippery. The good thing about having a guide with you is that he knows a lot and sees animals that we would have passed by without noticing. We see a lizard which is camouflaged so well that we wouldn't have noticed it if we bumped into it. We hike at night one time and see the pygmy mouse lemur, a fossa (small predator, related to the mongoose) and many others, all from close up. The animals aren't afraid of people at all. We continue our trip to Antananarivo with two taxi-brousses. We leave at 7 AM and arrive at 9 PM, and it's a distance of less than 400 kilometers. The road is okay, but we stop every five minutes. First, the driver has to pick up his clean laundry at his mom's. After 5 minutes we have to go back, because he forgot his shoes. On the way, he buys hay which he sells again a little farther down the road. We stop to eat and then everyone has to throw up (except for us, we eat biscuits because we don't trust the road restaurants. And apparently we are right). And thus the whole trip is one big party. The radio plays very loud and the children sing along. Cramps in our legs. When we finally arrive, we say: never again! But now we already feel differently.